One of the most phenomenal — and frankly, underrated — aspects of the handheld computing revolution ushered in by the iPhone and its ilk is how much power, in the form of knowledge, has been placed, literally, in people’s hands. Case in point: iCitizen is a new, free app that clearly and elegantly places pretty much all the information you need to know in order to make informed voting decisions — right in the palm of your hand. There you go: Direct democracy in the palm of your hand, courtesy of the iPhone (and the app’s developer). iCitizen provides all kinds of political data — and then let’s you interact based on that data. 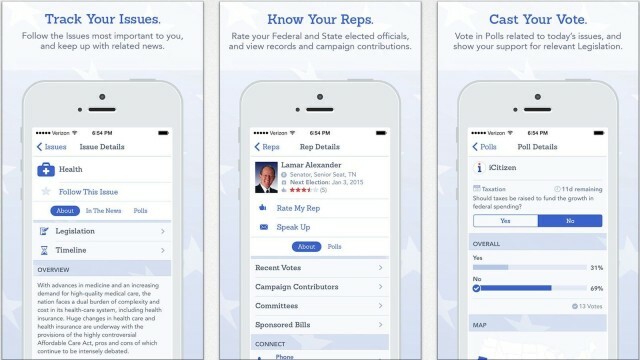 The app does the basic stuff, like showing you who represents your state in Congress and allowing you to easily communicate with them through email, phone or social media. But you can also easily lookup each congressperson’s voting record, keep tabs on important issues through news feeds, participate in daily opinion polls that apparently make it through to your representative’s desk — and even rate them. And the entire thing is presented in an easy-to-read, elegant layout; information is useless if you can’t digest it. The app is the brainchild of Nashville, Tennessee resident Rod Massey, and has steering from several former Tennessee politicians including former Tennessee senator (and former Senate Majority Leader) Bill Frist, and Bill Purcell, the former mayor of Nashville.